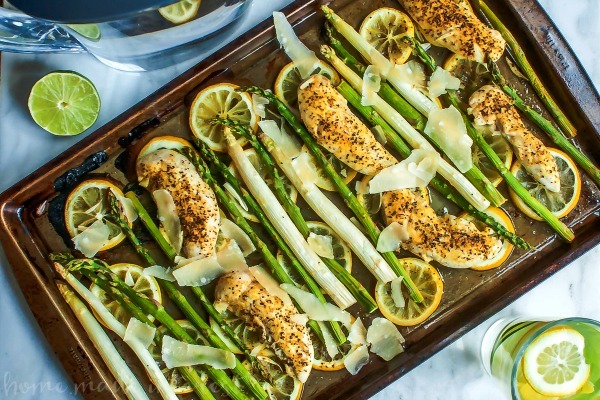 Sheet Pan Lemon Chicken and Asparagus - Home. Made. Interest. 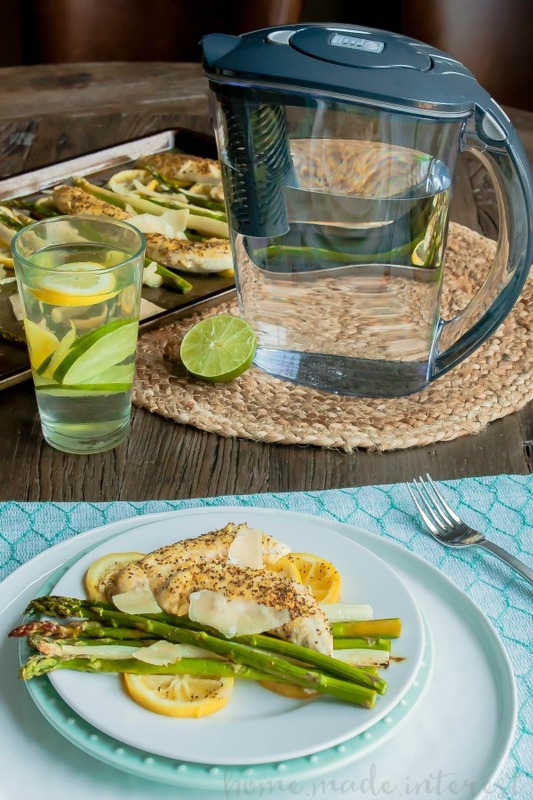 This Sheet Pan Lemon Chicken and Asparagus is an easy sheet pan meal that makes a healthy dinner in under 30 minutes! Quick and easy dinners like this Sheet Pan Lemon Chicken and Asparagus make getting dinner on the table on busy weeknights so much easier. All you need is a sheet pan, a few simple ingredients, and 30 minutes to make a healthy dinner for the family. Over the weekend I made this amazing Lemon Chicken and Asparagus sheet pan meal. I loved how simple it was. I just spread the ingredients over the sheet pan, seasoned everything and then popped it in the 425°F oven for 15 minutes. When it came out I grated some fresh Parmesan cheese over it and BOOM! Dinner was served. Asparagus is my favorite spring vegetable and I love the brightness the lemon slices add to everything. Add that little bit of shredded cheese at the end and …YUM! Healthy dinners are just about what’s on your plate. In an attempt to start drinking more water I got a new Brita Stream . The Brita Stream filters as you pour so you don’t have to wait. You just fill it up start pouring and out comes clean, filtered water. It’s also got a sleek, space efficient design so I can fit it right in the door of my fridge. I think my favorite part is it’s controlled pour. I don’t know about you but I am usually a total failure when it comes to getting water from a pitcher into a sport bottle without making a mess. The Brita Stream has a controlled pour that makes it easy. No spills so far! Having it in the fridge seems to be making a difference in how much water we all drink and I really like being able take it out of the refrigerator and put it right on the dinner table so we’re more likely to refill our glasses. Sheet Pan Lemon Chicken and Asparagus is the first sheet pan meal I’ve made and it won’t be my last. It was such a time-saver. We got to spend all afternoon playing outside and then when it was time to get everyone fed all I did was pop the pan in the oven and set the table while it baked. I put the Brita Stream on the table and served everyone’s plate and we were sitting down to a light, bright, spring dinner in under 30 minutes. Want more Sheet Pan Meal recipes? Sheet Pan – Definitely need one of these! You can line it with aluminum foil for easy cleanup. Tongs – These aren’t required but they make getting the chicken and veggies off of the sheet pan and on to a plate so easy. 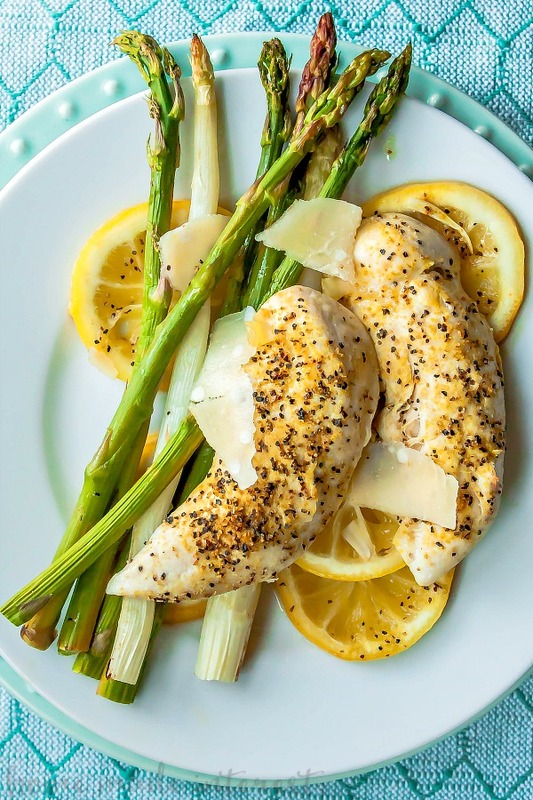 This Sheet Pan Lemon Chicken and Asparagus is a quick and easy weeknight dinner recipe with all the flavors of spring! Slice lemons into rounds and place the slices on a greased baking sheet. 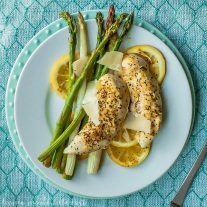 Place asparagus and chicken tenders over the slices of lemon. Drizzle everything with olive oil and sprinkle with salt. Sprinkle the chicken tenders with lemon pepper. Bake for 15-20 minutes or until chicken is fully cooked. Ready to start drinking more water? The Brita Stream is available at Target . Made this maybe two days after saw the recipe on Twitter. So delish! 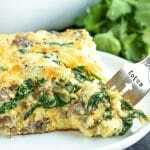 Amazingly simple and so tasty! Just FYI,go easy on greasing the pan. Just a spritz will do. The olive oil drizzle adds to the oil-factor. I went a bit nuts but I’ll use less next time. Really great paired with a kale quinoa salad! I’m so glad you liked it! It is a new favorite in my house. I can’t WAIT to try the Stubb’s Steak Nacho’s!! WOW-just what the ‘ol boy was asking for! Your recipes look amazing and I can’t wait to DIG IN!! WHA-HOOOO…. Can you make this recipe with broccoli? Would you make it the same way as with the asparagus? You can definitely make this with broccoli instead! Just slice the broccoli florets in half so the stems are thin enough to cook quickly. They should cook in the same amount of time as the asparagus.